This National League West franchise is among the most successful and longest-established MLB teams in history, and its passionate fan base has shown up at Oracle Park each season to cheer the San Francisco Giants to victory! 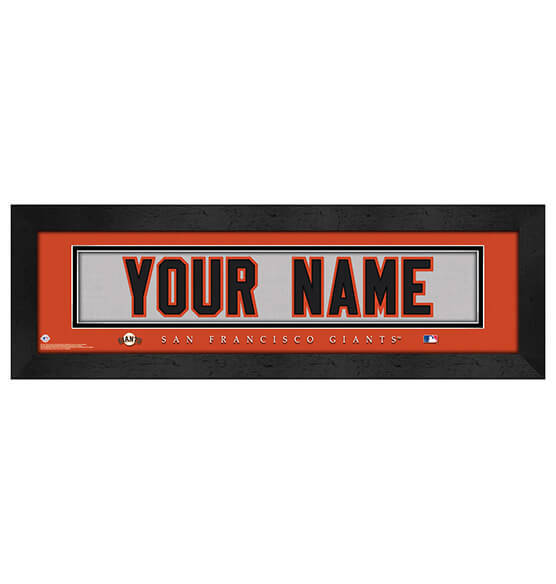 If you can't make it to the Bay Area, you can still cement your superfan status with our San Francisco Giants Personalized MLB Nameplate Wall decor to spruce up your fan cave. This high-quality sports decor comes ready to hang with a convenient sawtooth hanger. Its black frame looks elegant in any home or office. Featuring vibrant team colors, this nameplate is customizable up to 12 characters and looks like the back of a Giants jersey.